Her idea is to suspend small silver flakes in clear epoxy in the cloud area to get that nebula effect you two were discussing. These sketches look great! They really capture just what I was picturing myself. Can't decide yet on Milky Way or no Milky Way, I think it will depend on colors. 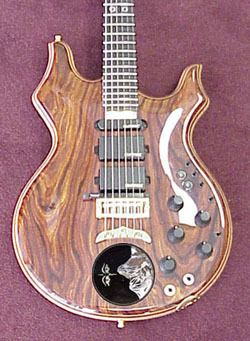 Susan also suggested I look at the Coco Bolo for Trib wood bank. I think I am most partial to "Crazy 652", "Wavy Rings 657" and "Wide Saturn Rings 666". I did see someone had already expressed interest in "Crazy" if so the others would be fine. Also if any of the pieces would come out darker than the others, that would be my preference. Anyway I am excited to get started. 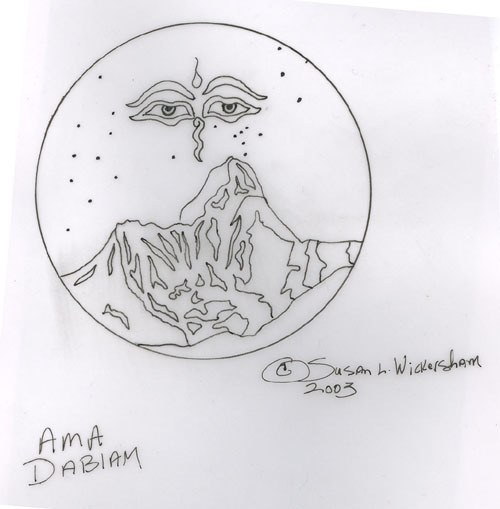 The Wisdom Eye of the Buddha! 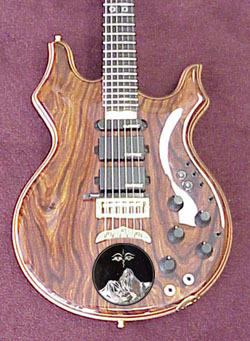 I've been planning to have the Wisdom Eye inlaid on my eventually-to-be-ordered Skylark! Since it will already have been done, maybe the upcharge for mine will be a little easier on the wallet! (Ha! Just kiddin' about that upcharge part!) Rock on, Court! May all beings be happy! There are three sizes of silver for the star field. Sirius won't be quite as large as it looks, I couldn't quite get the right size brush for the scale of this picture, but since it's the brightest start, it will be the largest one in the inlay. Hope you like it. I will post more Tribute tops in the Wood Bank by Thursday, Chip is making some more bookmatches this week. We've selected a few boards I think will closely match your preference. Courtney - I really like that idea for that inlay a lot. Where did you find that? Where is it going to be located on the instrument? Backlighting that would be cool too! Thanks for the updates. What can I say other than Wow! The mock-up looks better than I had imagined. Love the starfield. In terms of composition and layout the mock-up is exactly what I was envisioning. In terms of the overall look and the material/colors to be used, even better than I had hoped. Once again Wow! I can't wait to see the additions to the Trib. wood bank. I am still thinking about the LED in the bindi, my first reaction was no LED, but after seeing the mock-up and speaking to Susan about the size of the light I might be changing my mind. I assume the LED would turn on and off with the same switch that turns the LEDs on the neck on and off, right? Well guess that's it for the moment. Billy V - Thanks, glad you like the Eyes inlay. dela217 - Also thanks. 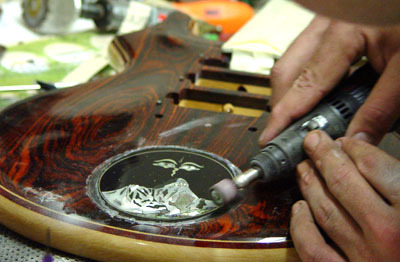 The inlay will sit in between the bottom edge of the guitar and the tailpiece, same location as some of the inlays on the other custom tributes discussed in the club. The inlay idea just kinda popped into my head. I was very lucky to have the chance to spend a fair amount of time in Nepal at Ama Dablam and some of the other peaks in that region. 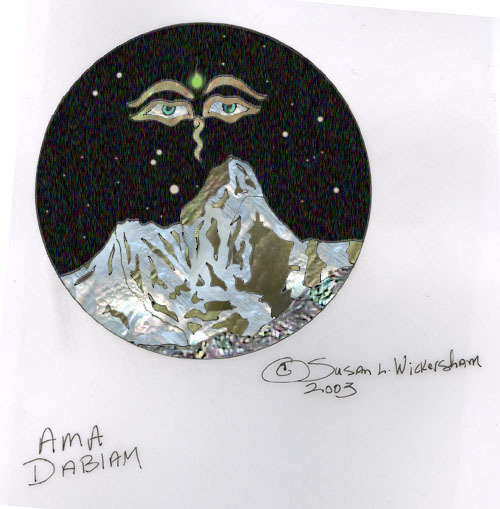 Over there the eyes of Buddha are carved and/or painted on countless rockfaces, boulders, buildings etc. I even saw a series of prayers and a set of eyes carved into the horns of an old and very weathered Yak skull while walking down a trail one day. Anyway Buddhist philosophy, mountains and music have always had a similar sort of salubrious spiritual effect for me, so it seemed a good combo. However the credit for turning this idea into such a great inlay belongs all to Susan, Mica and the folks at Alembic. Thanks again for your comments, always appreciate others' input. After further consideration and consultation I think I will go with the green LED on the inlay. 1) on the Tributes are the tops standardly bookmatched as they appear in the wood bank (and is this what is meant by bookmatched to center) or is that an extra charge? 2)I assume the back is from a different piece of Coco bolo, if so are their choices available for this as well or do you all find something aesthetically pleasing to go on the back? Well, I guess that was actually more like 2 1/2 more questions. The body has not yet been started for your guitar, so we're anxious to hear which top you'd like to get the construction rolling. 1. The Tributes (and all the set neck instruments) have a bookmatch to center as the default so there is no additional charge. It's quite a trucky bit of woodworking on a neck through, which is why BTC (bookmatch to center) is an additional charge on a neck through. 2. Yes, the back is an entirely different piece of wood. We'll usually select something that coordinates with the front. If you prefer, you can select one from the section labelled "Coco Bolo." These are the standard thickness laminates. Thanks for the clarification. I have decided on wood. If still available I would like to use 3135 "Wild" for the top and 3121"Dark & Unusual Color" for the back. I just love that one, too bad its not thick enough for the top. For both top and back I would prefer to have them oriented as they appear in the wood bank photos, and no sap wood. Please let me know if they are still available. I've reserved both pieces for you (the 3121 will probably have enough leftover to get a Stanley Clarke top for another project). We'll mark the work order to not include the sapwood and the orient it the way they are labelled (this is the default). If you didn't already have continuous wood backplates, I'd be lobbying hard for them - the back is so interesting. Funny you should mention that, I was just about to inquire about the same thing. I am fascinated by the patterning on all of the wood in question, especially around the bottom of the piece for the back. So definitely continous wood backplates! Please let me know what the additional cost will be. You all have my number and e-mail address. It's an additional $400 for the CWB. Chip was cutting the rest of the wood for the body today. He'll be consulting with Kris tomorrow or Monday about the construction since we haven't made a Tribute yet with an LED below the tailpiece. Gotta get all the plumbing just right. Either my mom or I will call you in the morning to make a final run down of the specs since some serious wood is about to get flying. Can't wait to see the finished guitar. Got the word about the backplates, so i've made sure they are included on the order. I can't wait to see the back on a finished guitar. It's gonna look so cool. Definitely had to go for the CWB. That wood you're using for the back is the coolest piece of Coco bolo I've ever seen, great pattern and really unique coloring. I'm very excited to see it too. BTW: this is not a picture of your guitar, I just used it for positioning. The inlay is your actual inlay however. That looks great, but to tell you the truth I was always thinking it would be rotated about 90 degrees counter-clockwise. So that the horizon was up when the guitar's neck was parallel to the ground i.e. more or less in playing position. Now I am not sure. Could you send me a pic with this other orientation, please? By the way last week Susan had mentioned you were going to send me something by private e-mail. If you want to do just one e-mail you can include the orientation picture to cdf@theworld.com Or post here, either way is fine with me. Once again looks great. 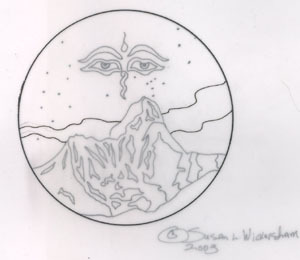 I was going to send you an in progress of the inlay, but since it's done, well, you've seen the real thing! Let me know which horizon line you prefer. Well, Now I am thoroughly confounded, I just don't know which one. I have even turned my computer's monitor on its side to check out that aspect. I will sleep on it and let you know tomorrow. In the meantime if anybody out there sees this please feel free to chime in with your opinion, 'cause I really like em both. I like the one with the green LED! If it was me, I'm pretty sure I'd go for the first one. When playing, my arm would be covering up a good piece of it (and of course it would be upside down to me), but when it was resting in a stand or hanging on the wall it would look right. It's nice to think about how it will look to other people, but you're the one who's going to see it the most - and I don't think it's too selfish to give that priority. Even all that aside, it looks more balanced to me. Of course, maybe none of this applies, and you can't really lose either way. Nice to see that it's coming along. I like the second one better. To me it feels more natural. But it's cool in both ways. Alright time to make up my mind here. I have gone round and round on this, but I think lets do the orientation as you first suggested in your post numbered 1133 i.e. so the mountain lines up with the neck. Ok better sign off lest I change my mind again. BTW thanks for the opinions. Mike already did the fignerboard scrolls inlays. Your guitar is back in finish now so it's not long from completion. Many thanks for the pic and the progress report. Looks fantastic! Can't wait to see it with the hardware too.